Bristol based Skateboard Cafe kick off 2012 with a fresh update on their apparel range, including classic logo T-shirts, pocket tees, and a small selection of fleece. Keeping things simple, the first drop includes both white and heather grey versions of their ‘Starfucks’ T-shirt, a white pocket tee with the brand’s Cafe logo printed big on the back, and two contrasting polka dot pocket tees. There’s also a steel grey Starfucks logo crewneck, and a simple black pullover hood. 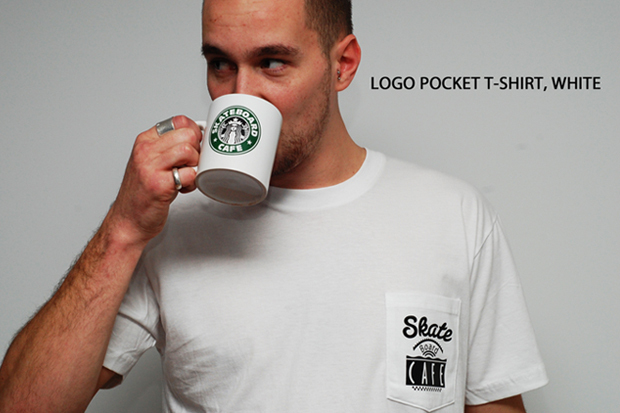 As a cheeky finale, Skate Cafe also produce a cease and desist inducing mug to round things off. Show your support by picking one of the pieces up now through Skateboard Cafe on facebook. i like this. i wonder what starbucks think? i’d buy it.